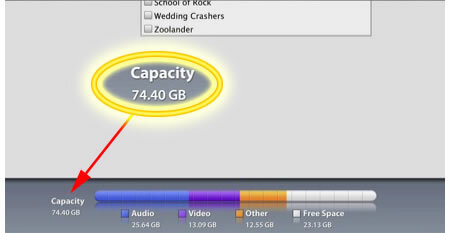 If you go according to the video on the iPhone’s AT&T activation, then iPhone is supposed to have a 74.40GB capacity. No, you don’t need to pinch yourself awake, just go to about 6min and 17seconds into the video, you will see it for yourself. I’m hoping someone tells me its not the sins of morphing the 80GB iPod video with the iPhone’s but a reality!